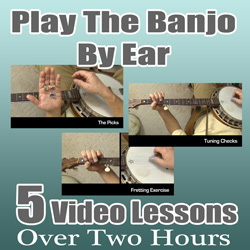 This lesson introduces some new rolls and patterns and will lead us to learning the complete version of "Cripple Creek". These two exercises both use the same right hand picking pattern. The last half of each measure sounds similar to the previously learned "Thumb-Pinch" lick, but in this case it is a "Middle-Pinch". The second measure is just like the first, except in this case you hold down two fretted notes (part of the C Chord) and lift them for the "Middle-Pinch". Use your left hand index finger to play the 1st fret note on the second string and use your ring finger on the 2nd fret on the first string. Here are the first 3 measures of the A Part of Cripple Creek. Notice that the song starts on count four after three silent rests. It starts with a fretted "pinch" and then you slide your fretting finger up to the fifth fret. Your landing there should coincide with the count "one" of the next measure. Notice that you do not pick that first note in the second measure! It is sounded only by sliding up. Then the third measure is the exercise you just learned above. If you are confused play along with the audio track. Hang in there! 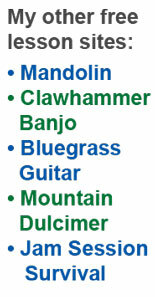 We now have covered all the techniques learned in order to play the entire song Cripple Creek-- and hundreds of other songs! All we have to do is string all these parts together to assemble the complete song.